The world’s tallest snowman isn’t a man at all. 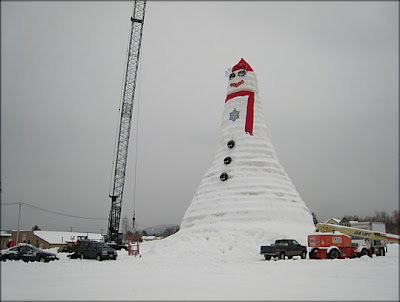 Creators unveiled a 122-foot snowwoman in Bethel, Maine Friday morning. With skis for eyelashes and red-painted tires for lips, she is a whole-lot-of-woman. Maine creators named their snowwoman “Olympia” after their Senator who is ironically named Olympia Snowe. Olympia’s creators made her arms out of pine trees and she too has her share of glitz and glamour as a giant snowflake pendant, more than six feet in diameter, hangs from her neck. This ice princess will be around for a while; she isn’t expected to melt until May.